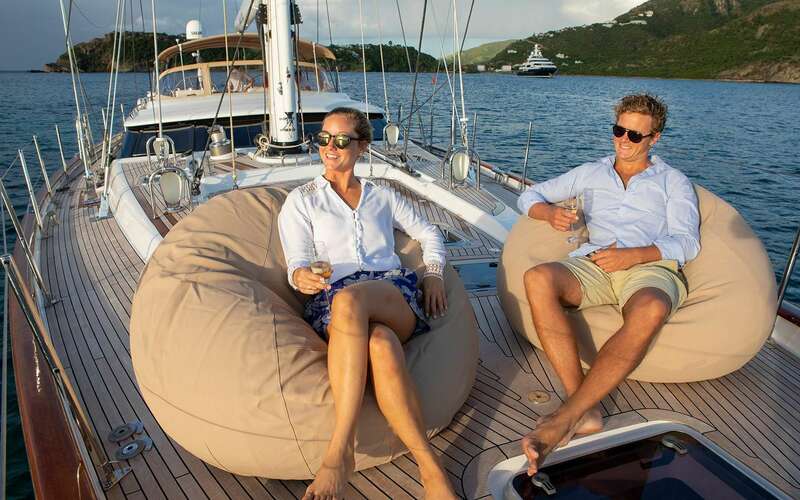 Dama de Noche is a stunning Oyster 82 luxuriously appointed with teak planked soles and neutral soft furnishings including leather giving a light and airy and contemporary feel to the interior spaces. 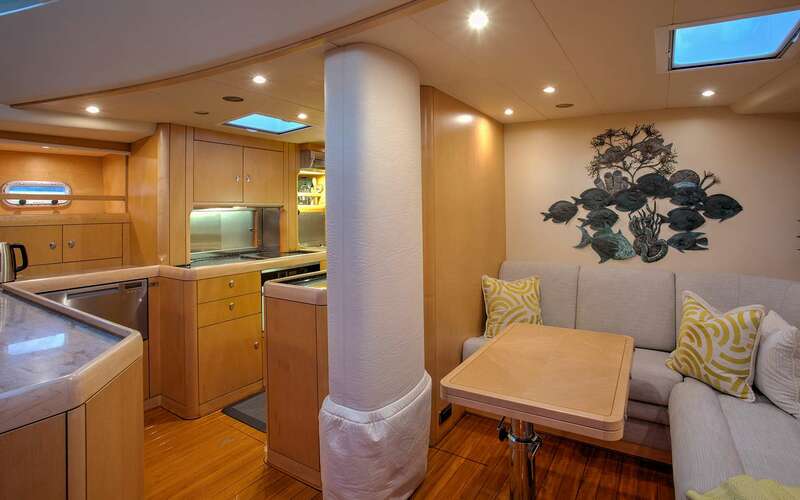 The Oyster 82 offers versatile and surprisingly spacious living areas comparable to a much larger design. The upper salon is window height providing great views with a large table for inside dining. The lower salon is a great spot for the library or watching a movie. 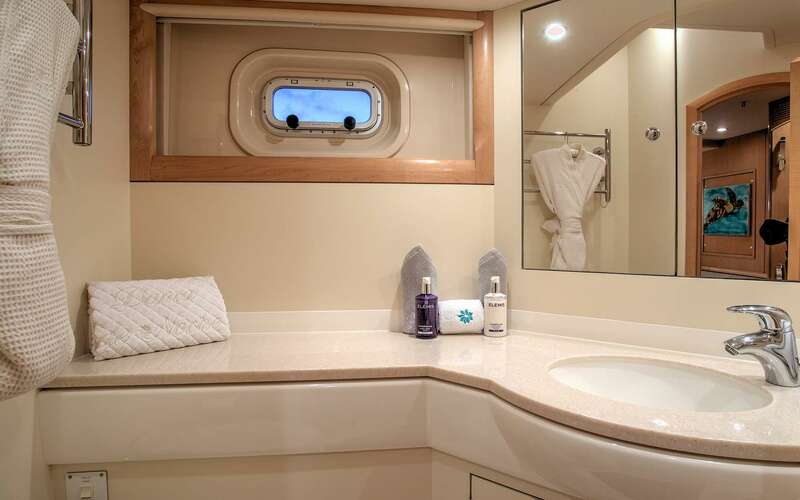 Dama de Noche can accommodate six guests in three cabins each with an ensuite head with shower. 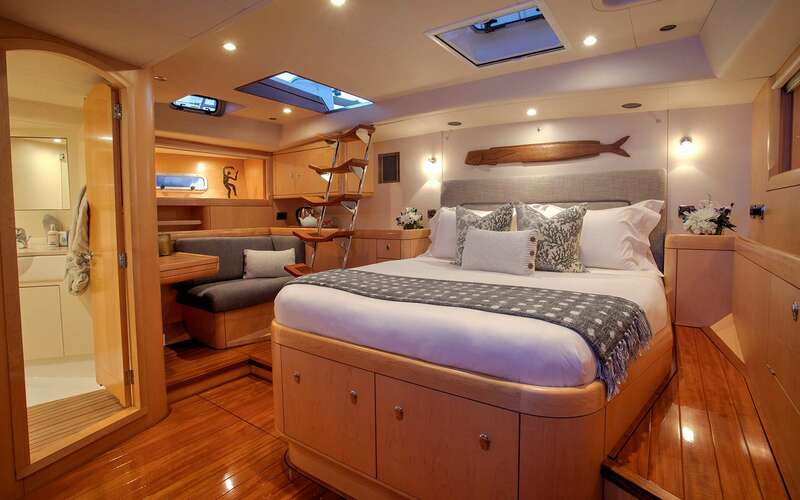 The main cabin has a centerline double berth with a private access to the aft deck. 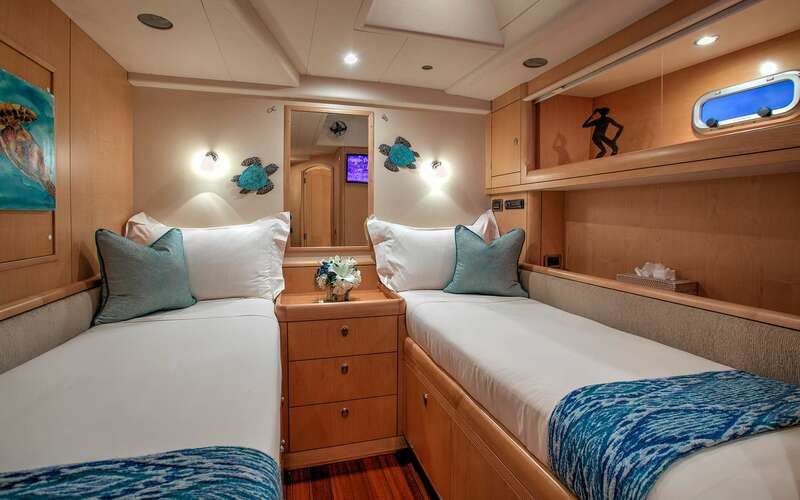 The Starboard cabin has a double berth and the Port cabin two side by side twin beds. 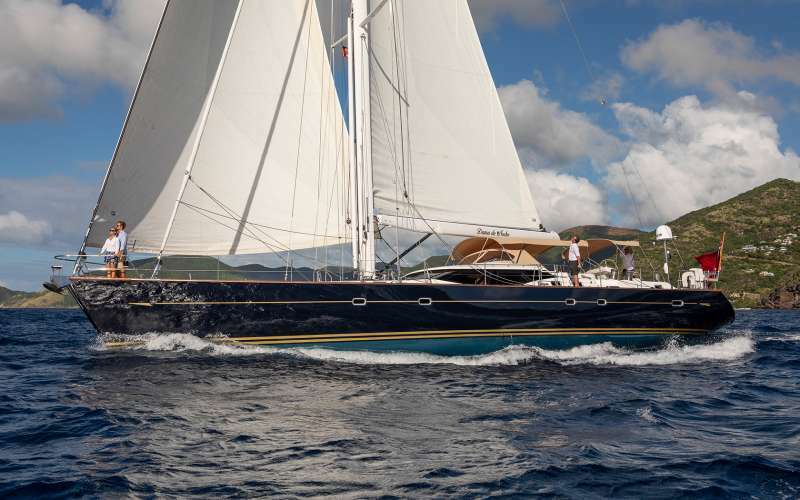 The yacht features full hydraulic sail handling with in-mast furling. The guest cockpit has a clear central walkway aft, giving access to the helm positions and side decks. There are two large cockpit tables ideal for exterior dining. Grant and Tara’s love of the ocean, sailing and discovering new places is infectious. They are both certified and experienced Yacht Master Ocean Skippers. 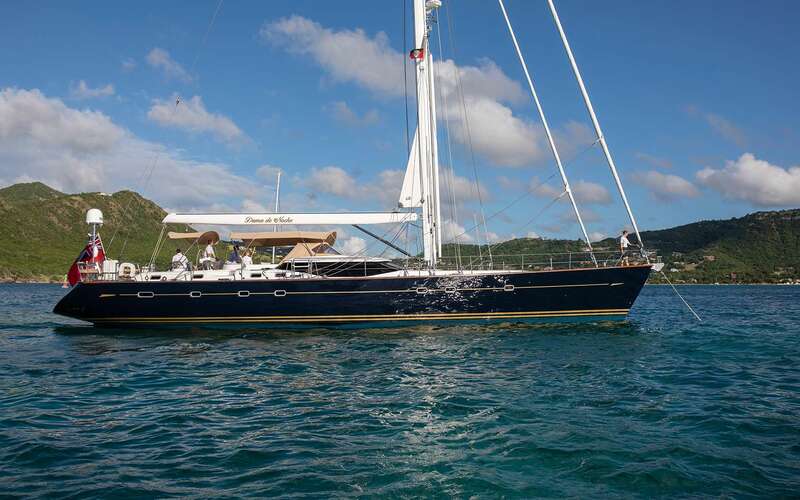 Over the past ten years they completed over 200 weeks of charter as captain and chef, sailing catamarans throughout the Bahamas, Caribbean and USA. Tara is a gifted Dive Instructor and Chef and enjoys sharing both of these skills with guests. They met 10 years ago in South Africa while attending the Ocean Sailing Academy. 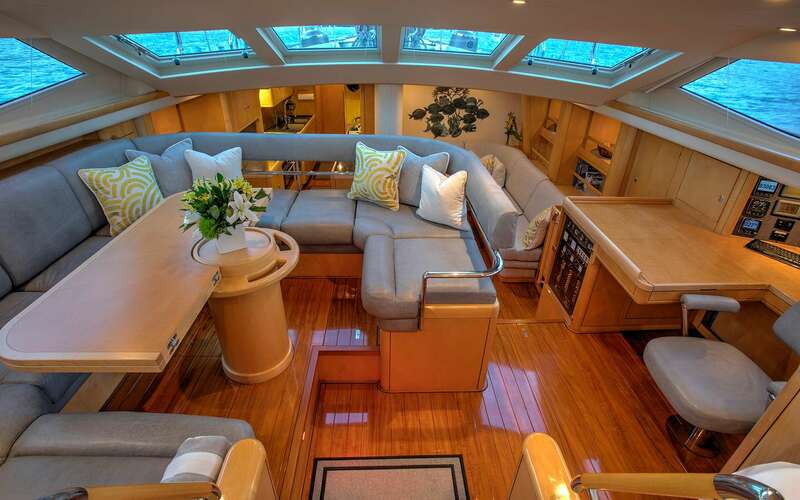 In early 2008, the opportunity presented itself to crew on a luxury catamaran and they have been together ever since. 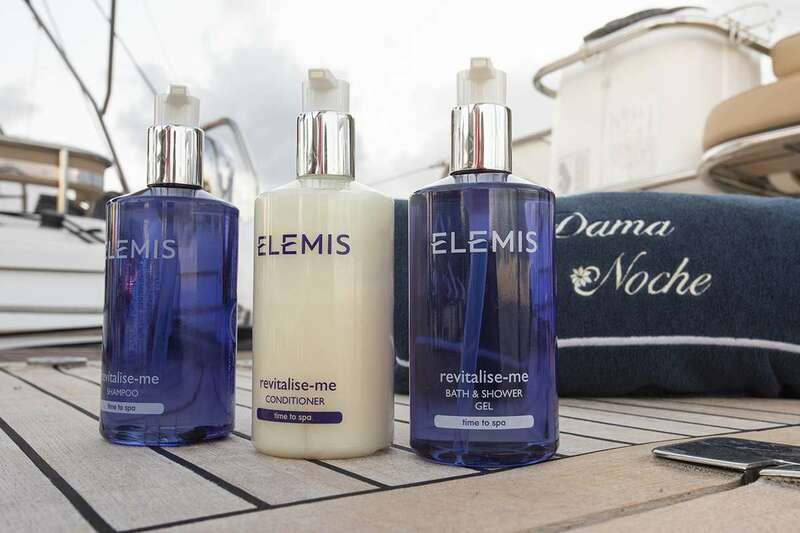 In addition to their significant sailing, diving and hospitality experience, their warm, outdoorsy and fun personalities as well as welcoming manner make them a delight for charter guests to spend time with, aboard Dama de Noche. Grant was born in South Africa and grew up in Botswana, before moving back to Cape Town. He has been sailing the unpredictable African wild coast from a young age with his family. Shortly after finishing high school he moved to the United Kingdom to study Software Engineering. After years of study and part time racing sailing yachts on the south coast of UK, Grant decided that a 9 to 5 job was not for him and so pursued a career in the yachting industry. He holds a Sailing Yacht Master Certification. He has sailed the coasts of South Africa, the U.K., the Caribbean island chain and the east coast of the USA. Grant’s technical and computer (software diploma) skills contribute to his expert seamanship as well as in-depth understanding of the varied mechanical, electrical and digital systems aboard Dama de Noche. Grant’s Advanced open water diving qualification helps Tara’s diving stewardship as a Master Diver and Scuba Dive Instructor. Tara was born in Victoria, Australia in the outback countryside. From a young age she loved the water and working with animals. While training and competing in the equestrian industry, she also excelled in national swimming competitions. After finishing high school she complete a Diploma of Dive and Resort Management. The love of animals and swimming brought her to the ocean to discover more about marine life and so pursued a career as a scuba diving instructor, working the islands of the Great Barrier Reef in Australia. Scuba diving opened the doorway for her into the yachting industry. Her first step was getting a powerboat license. Next she became a crew member on Super Yachts in the Mediterranean and Caribbean, working her way up to assist the chef on a 41 Meter mega yacht. Finally she earned her Yacht Master license. 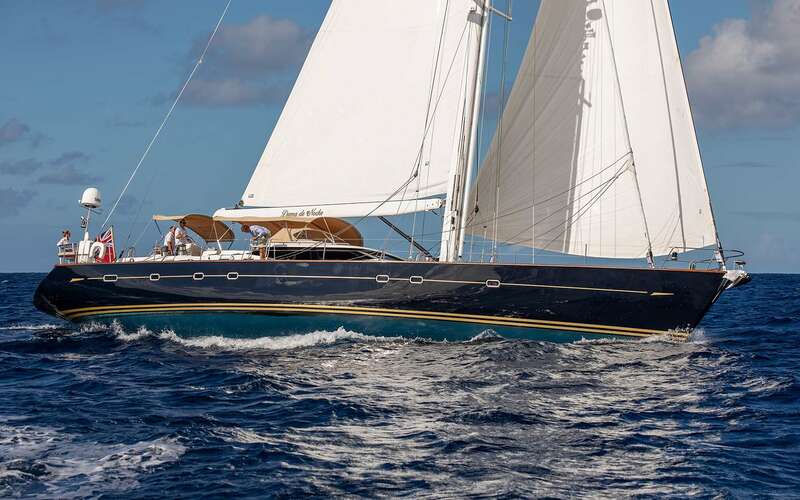 In addition to working on yachts in the Mediterranean, the Bahamas and the Caribbean islands, Tara was also part of three Atlantic crossings. 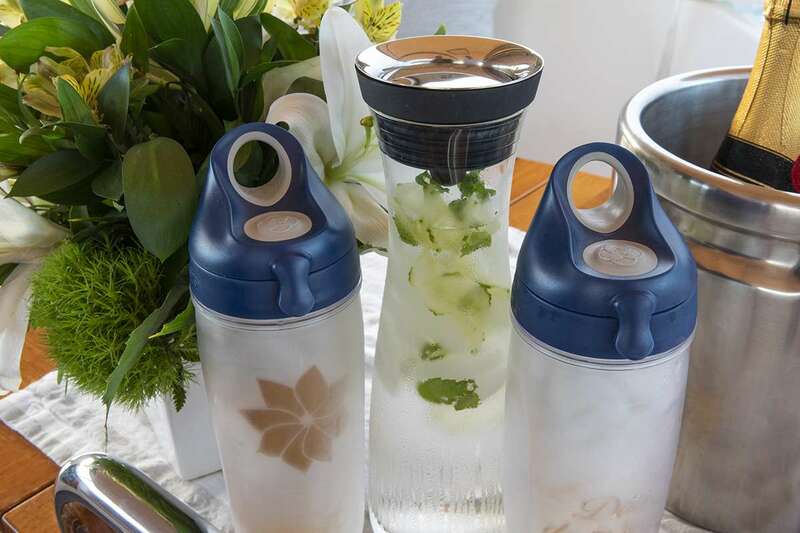 Grant and Tara’s vast experiences combined in sailing, dive instruction, world travel and gourmet cooking, blended with the warm hospitality of the Safa’s and the Aussies, will guarantee you the vacation of a lifetime, every time, aboard the Luxury yacht Dama de Noche. Cooking is part of Julianna family's tradition and enjoys the fact that they are united by the kitchen. She has sailed since she was 15 years old and by crewing boats on deliveries and expeditions she found that she was very comfortable cooking onboard. She was invited to study culinary arts in Argentina and became a chef/mate/stew in the Caribbean with a colleague. Julianna describes her profile as a chef who works along with the seasons. She likes using local fresh ingredients. Seafood, spices, fresh veggies and international twist is her trade mark. She likes mixing Asian influences with Mediterranean cuisine, traditional Brazilian recipes with central American ingredients and much more. 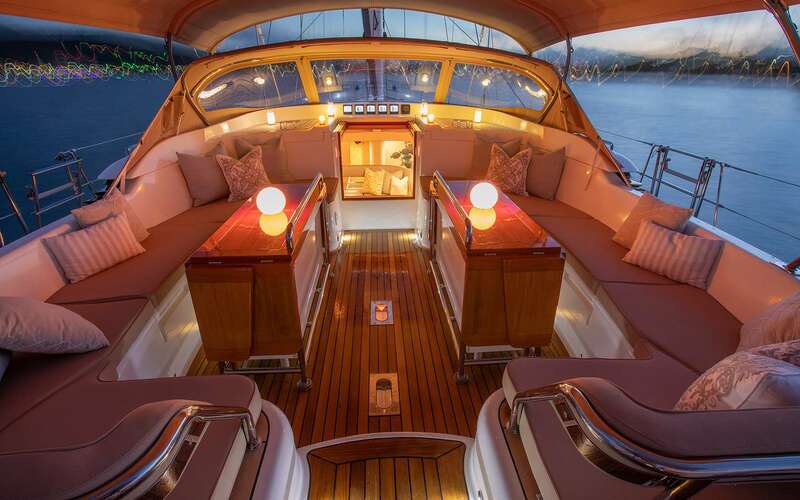 Aboard Dama de Noche she will bring to the guests an unique experience and global culinary. From simple daily recipes with international twists to fancy traditional meals from old recipe books. Always trying to combine her skills with local influences! 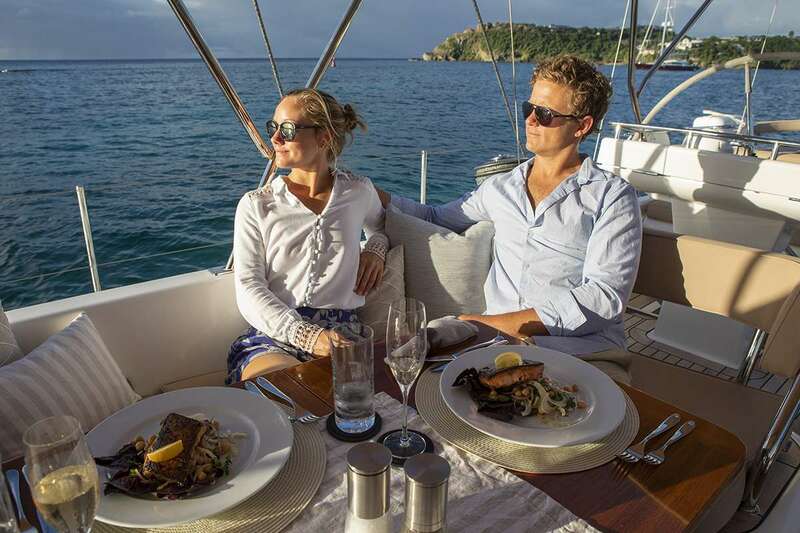 Grant, Julianna and Tara’s vast experiences combined in sailing, world travel and gourmet cooking, blended with the warm hospitality will guarantee you the vacation of a lifetime, every time, aboard the Luxury yacht Dama de Noche.